Texas A&M softball was defeated, 8-6, by No. 6 Florida in the first game of their three-game series. The Aggies dug themselves into a hole early in this game, surrendering seven runs in the top of the first inning. Despite a valiant comeback attempt, A&M ultimately came up short. The Gator’s hitters came out of the gates red hot. Florida had the luxury of 12 at-bats thanks to Texas A&M’s inability to throw strikes early in this inning. 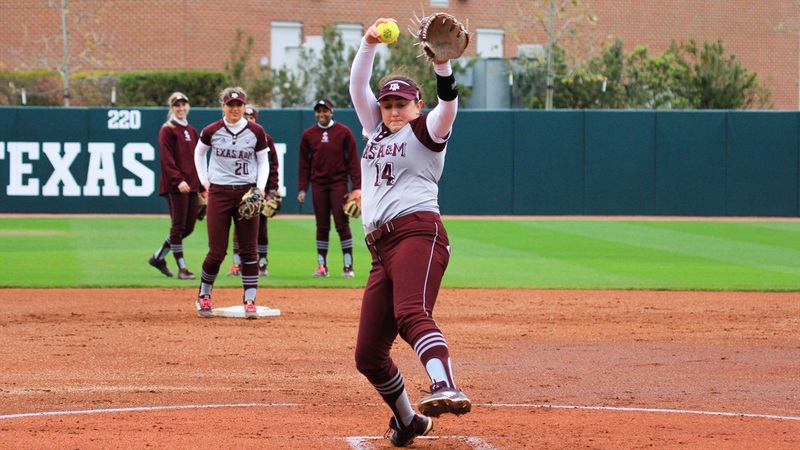 Sophomore Kayla Poynter started the game in the circle for Texas A&M and struggled early. She had trouble with the location of her pitches. After surrendering seven runs in just eight at-bats, Head coach Jo Evans was forced to go to her bullpen with only one out in the top of the first, opting for redshirt freshman Hannah Mayo. It looked like Florida was going to run away with this one. However, credit Texas A&M for remaining engaged despite being faced with a large deficit. Mayo did an excellent job in relief. She was put in a really tough spot, but she responded well. “I have a tremendous amount of confidence in my offense, I wanted to make sure I kept them in the game enough to give them a chance to comeback” Mayo said after the game. “I think the way we left that game shows that we’re ready for tomorrow and Sunday”. The Aggies furious comeback ultimately fell short against the Gators. The Aggie’s bats came alive in the bottom of the fourth. Texas A&M’s Blake-Ann Fritsch got things started with a lead off single, followed by hits from Baylee Klingler and Payton McBride. Texas A&M notched 11 at-bats and were able to cut Florida’s lead to two runs, scoring five runs in their fourth inning rally. However, it would not be enough. The Aggies were unable to complete their comeback attempt. Both teams would end up scoring one more run each before the game ended in an 8-6 Florida victory. In addition to Mayo’s performance, freshman Morgan Smith’s performance at the plate was another bright spot for Texas A&M. She remained in the game after pinch hitting for Kylie George in the fourth. Smith went two for two at the plate with one RBI, while also holding her own defensively in the outfield. Evans was asked about Smith’s performance after the game. “She’s nails, she’s done that so many times, it’s almost becoming expected”. Evans said. “She’s doing a really great job of understanding her role and embracing it. It’s made a big difference for our ball club”. Despite suffering a loss in the series opener, A&M’s comeback efforts should give fans a reason to feel optimistic about the two remaining games this weekend. The Aggies will be back at Davis Diamond tomorrow with an opportunity to avenge their loss to the Gators. The second game of the three-game series is scheduled for 6 p.m. and will be streamed live on SEC Network+.